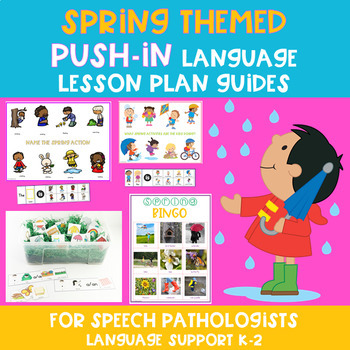 The language activities in this set include tips and tricks for how to do push-in speech therapy. There is also a cheat sheet guide with recommended books (links include to YouTube videos or amazon), links to themed movement videos, Included in this resource are language extension activities with a spring theme, a Google Slide spring presentation, as well as a letter home to parents explaining ideas, books and activities they can do at home to re-inforce the new vocabulary. The cheat sheet lesson plan guide has links to the common core standards that the activities are targeting. Not really able to push-in therapy, but love using themed language activities? Have trouble planning activities for all the goals in your group using themes? These spring language lessons can be used in small group sessions. And you can target a lot of different language goals! The lesson planning is all mapped out for you, so you can spend your time focused on helping students build their language skills. This push-in language activity set has a "Can you find it?" spring sensory bin as well as low prep crafts to work on functional communication. CORE boards with related fringe to the craft are included. ⭐How to use these lessons in the classroom and/or in a small group. ⭐Tips and tricks for doing push in speech & language support in the classroom. ⭐Blank lesson plan template (2 versions) to fill out before the push in lesson. Fill out with the teacher if you have collaboration time. A digital copy is included on Google Slides to edit and share with the teacher. ⭐Letter home to parents/guardian about additional language activities to support the spring theme. ⭐Spring Push-In Lesson Cheat Sheet – A digital version is included in the google slides (fonts: KG Primary Penmanship). ⭐Can You Find It? spring sensory bin with visual supports, visual sentence frames, and spring vocabulary stimulus items. 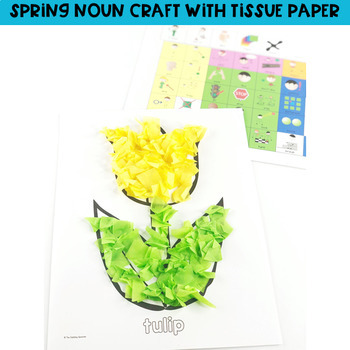 ⭐Spring noun craft printables and CORE boards to use with the craft. 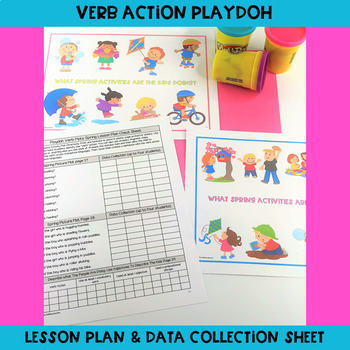 ⭐Playdoh Spring Picture Mats and lesson plan guides for the spring Mats including a data collection sheet to take data in a group. 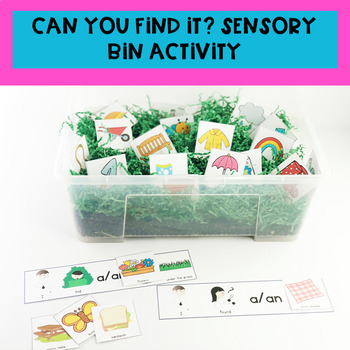 ⭐Cheat sheet for instructional aids and teachers for the spring sensory bin and spring noun craft. ⭐Cheat sheet instructions for instructional aids and teachers for the playdoh spring picture mats and the spring BINGO game. ⭐Who Has The Umbrellas? Turn taking & asking “who” questions with peers. Print up the umbrella pictures, laminate if desired and cut out. Have all the students close their eyes. Explain that if the student gets an umbrella that they have to keep it a secret. When all the items are hidden, pick a student or students to ask his/her peers if they have the item? Continue this activity until all the umbrellas are found. ⭐Spring Simon Says Preposition Game, preposition poster and sentence frames. ⭐All About Spring Google Slide presentation with wh-questions, links to YouTube videos and movement activities. ⭐Digital lesson planner that you can email and share with the classroom teacher. Add links to videos or activities that the teacher may need to access from their computer. The lesson plan cheat sheet is also available in a Google Slide form, so you can share with teachers or access digitally during the lesson. ⭐Digital parent letter home to send via email. To customize, you can edit the blank template included.